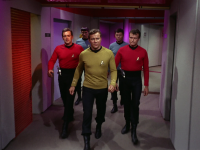 Star Trek TOS - 3x05 - Is There In Truth No Beauty? - Pretty lame episode with no significant long term continuity. 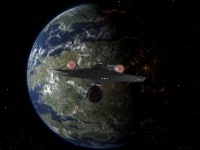 - When they cross the barrier at the edge of the galaxy, Spock says: "When we exceeded warp speed factor 9.5, we apparently entered a space-time continuum." As if they weren't in one to begin with? What a poorly written line. - At the end when Miranda and the Medusan ambassador beam off the ship, Spock puts on his protective visor, but Kirk does not. - This episode contains the first display of the Vulcan symbol of IDIC and the mention of its philosophy. - Diana Muldaur, who plays Miranda Jones in this episode, has previously appeared as Ann Mulhall in Return to Tomorrow. - Scotty realizing he's in the same room with the attempted murderer. - McCoy: "He's dead, Jim." Count 7. - The revelation that Miranda is blind. 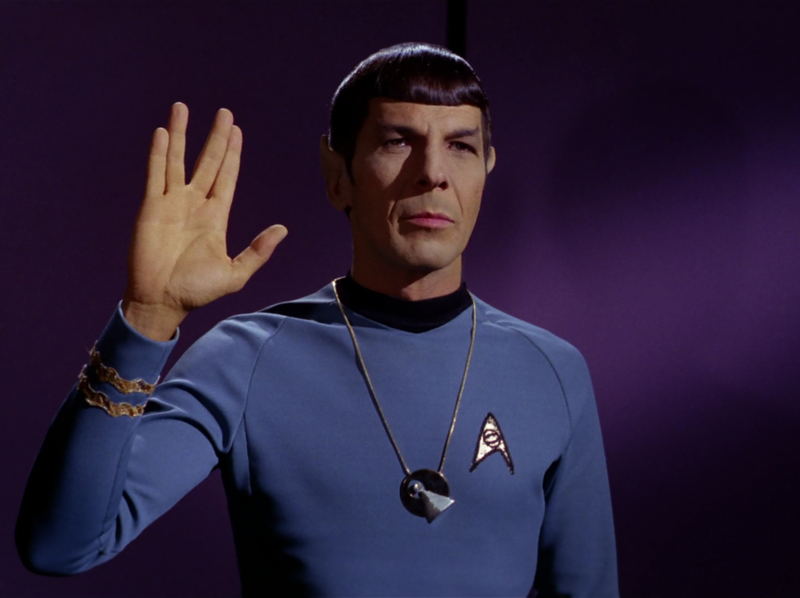 - Spock becoming the alien ambassador. An episode with a lot of intriguing ideas but so poorly executed that they fall flat for the most part. 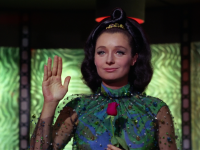 The delightful actress Diana Muldaur having already played Ann Mulhall in Return to Tomorrow returns to Star Trek for a second time to play the blind telepath Miranda Jones in this episode. This time around she is given a much stronger character to play, but unfortunately while Miranda was well conceived and stunningly original, her central motivation of jealousy wasted much of her terrific potential. Adding to the list of disappointments was the entire concept of an alien that is quite literally too ugly to be observed. While I'm glad the writers attempted to do a truly alien alien, their goal for this plot point of trying to make a commentary about human vanity didn't quite play, as in order for the concept of insanity induced by the mere sight of something to make any kind of sense at all, we have to assume the harmful exposure somehow induces some kind of neurological damage rather than the insanity being caused simply by some component of human shallowness as the episode repeatedly tries to imply. In that regard, introducing a character like Larry, a man who participated in the design of the Enterprise, was a wasted opportunity. Aside from some quick lines of admiration from Scotty, Larry turns out to be little more than a throw away character to make the Medusan ambassador and Miranda seem dangerous. He spends much of the episode acting clingy toward Miranda in ways that stretch the character's authenticity to the breaking point. 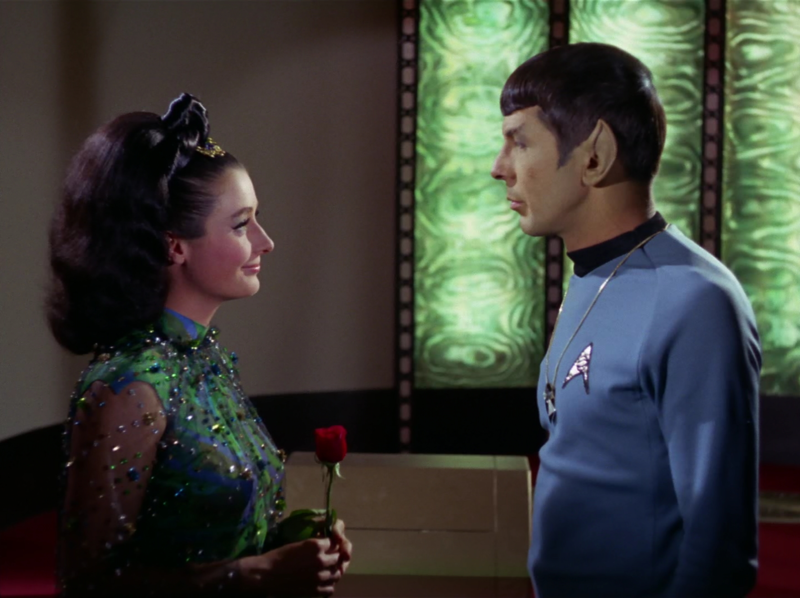 I can certainly see why Miranda wouldn't want to return the affections of a man acting like that, but she acted nearly as irrational throughout much of the episode too, which came as a surprising disappointment for a human character so well versed in Vulcan mental discipline. Especially disappointing was the scene when she misinterpreted Spock's display of the Vulcan IDIC as some kind of personal attack. From that moment forward, her character started to go downhill. The climax of absurdity for Miranda's character is the moment when Kirk resigns himself to distracting Miranda in the garden while Spock attempts to merge with the Medusan ambassador. 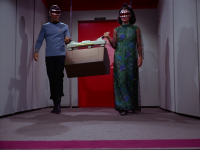 The whole scene is premised on the idea that everyone expects Miranda to be too overpowered by her jealousy to allow Spock and the Medusan ambassador to save the lives of everyone on the ship. Once again, like the children from the previous episode, I'm wondering why they didn't just phaser or sedate Miranda if they were so afraid of her presence being that disruptive in a crisis situation. While I enjoyed that Miranda's layers of complexity were revealed slowly over the course of the plot, the cleverly late revelation of her blindness in particular, her character flaws ended up being flaws in the story rather than the successful establishment of a tragic character. By the end, I felt that the rose metaphor applied more to the episode itself than to the character of Miranda as the writers intended. 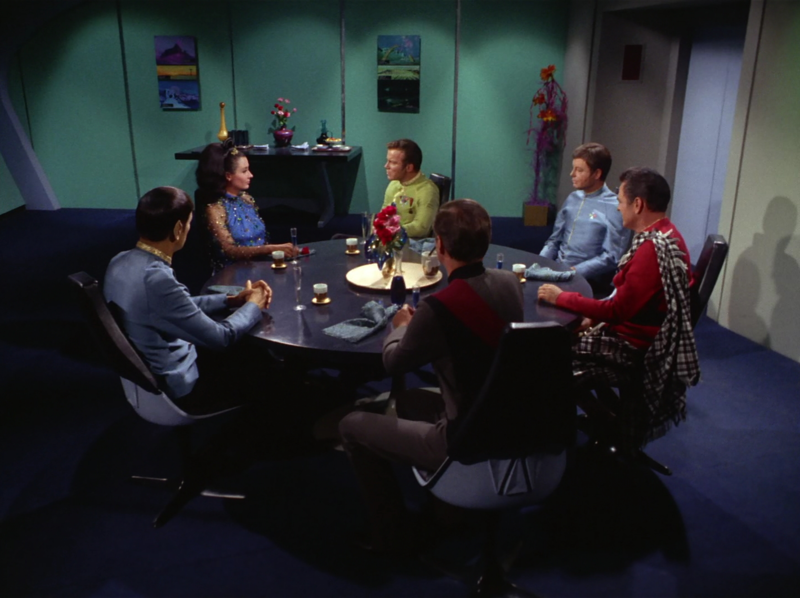 It's the episode itself that had the beauty and potential for profundity but was marred by the thorns of poor plotting. 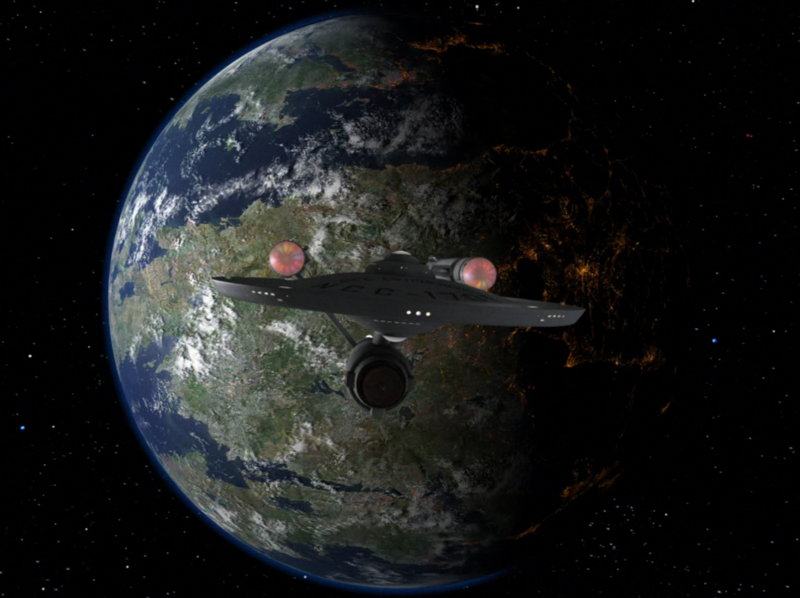 Aside from the mixed impact of Miranda, another notable detail was the unusual cinematography of the episode. 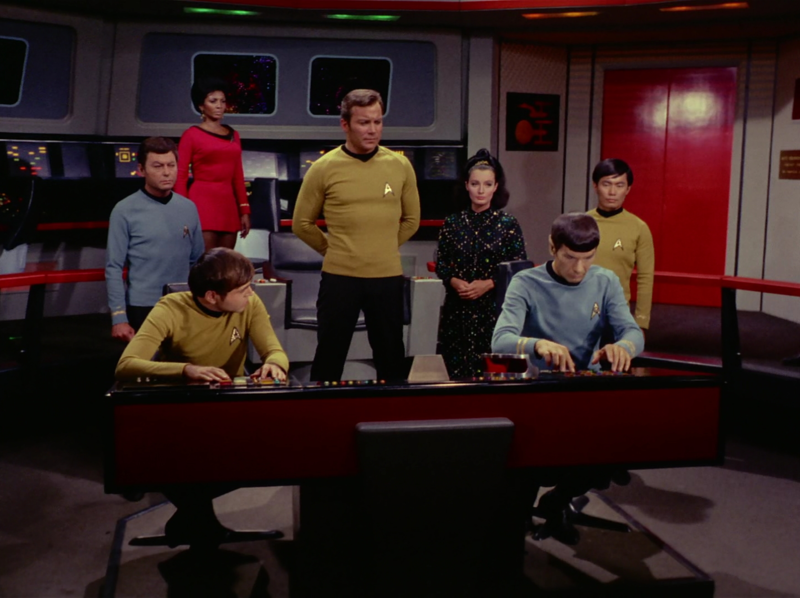 The Spock POV fight scene was especially interesting to watch and there were a few other similarly oddly shot scenes throughout the episode too. But unfortunately not all of them worked. Much of it felt as though the trippy cinematography was an attempt to distract the audience from a story that verged on incoherence at times. Last but not least, I'm left to wonder what is it with telepathy episodes and the ludicrous fictional barrier at the edge of the galaxy? 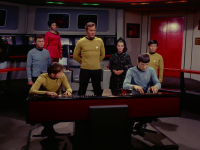 This annoying barrier first featured in Where No Man Has Gone Before makes an unwelcome recurrence in this episode, complete with new annoying details to further assault the realism of the story, such as the fact that only a few minutes moving past warp 9 was sufficient to take the Enterprise past the barrier. They must have coincidentally already been pretty close to the edge of the galaxy already for that to happen. When they cross the barrier, Spock utters perhaps the most ridiculous line ever written for him, when he says, "When we exceeded warp speed factor 9.5, we apparently entered a space-time continuum." Seriously? Something tells me the writers didn't know what a space-time continuum is and were hoping the audience would share their ignorance about one of the most basic concepts in theoretical physics. Anyway, while this episode definitely has some fun concepts, it could have used a lot more polish before it ever got in front of cameras. A shame. Re-watch the film, and pay attention to the extraordinary music and crazy direction. While there are clearly stupid/silly sides to this episode, the filmmakers of ST are still taking things VERY seriously. You can't see filmmaking this crazy outside of avant-garde filmmaking in the 1960s; not even Twilight Zone. The story could have used a few rewrites. It just jumps from situation to situation and ends up being a typical "get the ship out of danger" episode when it could have been something a whole lot deeper. Was it established that this was the Great Barrier we've seen in previous episodes? 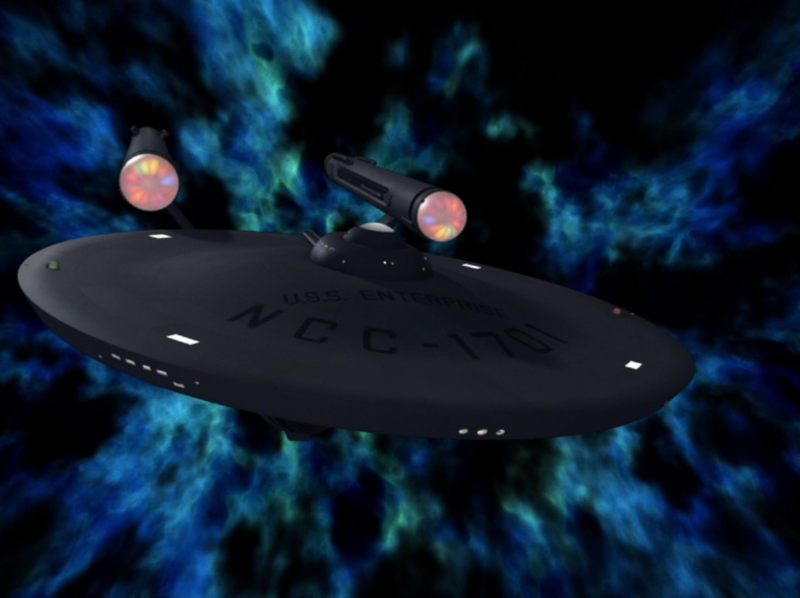 I assumed that it was just a re-used shot, and that the Enterprise has slipped into a pocket of subspace similar to the Chaotic Space in the Voyager episode "The Fight", and so needed assistance to navigate out of. Well Deggsy, I can see you haven't made your way to "Mudd's Women" yet. In that episode the men didn't fawn, they actually drooled. And, yes, it is the same barrier – and of course, in both episodes it is quite idiotic. If it actually did exist, how could one ever see anything outside of the Milky Way? Let’s just chalk it up to less than perfect writing. But, then again, who would have ever thought at the time there would be fifteen thousand PhD theses picking the series apart, or that folks wold be doing exactly what you and I are doing right now. Problem: If the Medusan is too ugly to look at, why are we, the audience, given any glimpse of it at all? If it doesn't make us go mad, why should it be able to make any of the characters do so? 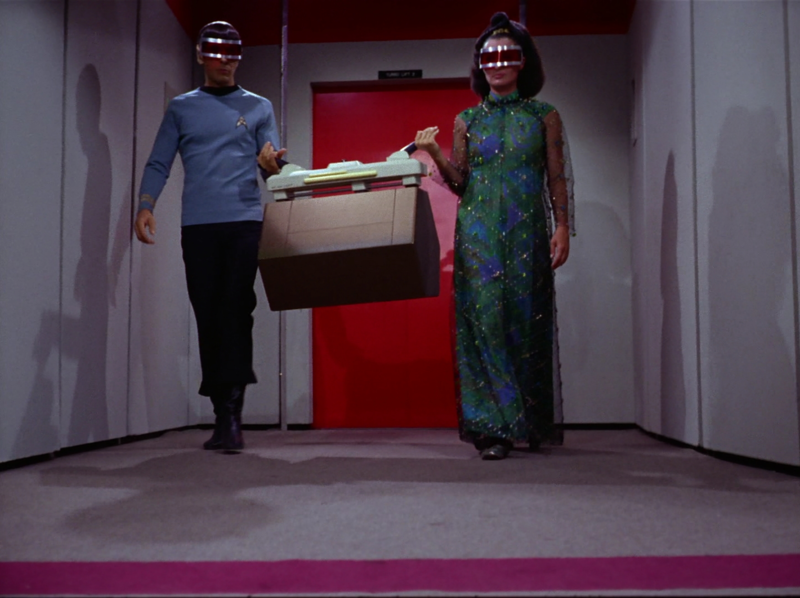 This episode establishes that people still play tennis in the future. 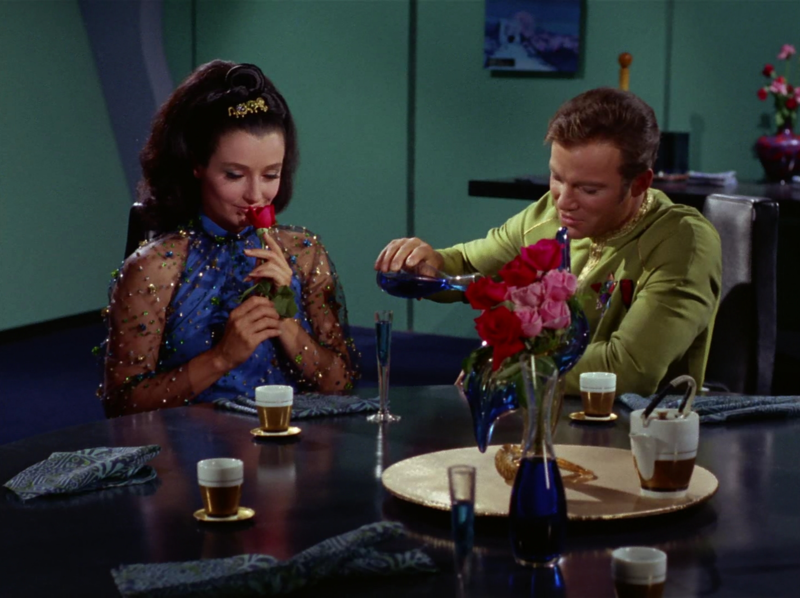 It also shows the rare (if no completely unprecedented) instance of Kirk being completely unsuccessful in his efforts to seduce a woman. She gave him absolutely no encouragement but he still tried to kiss her. 1. Right after Kirk was trying to seduce her in the garden, and she was having none of it, they then find out she was blind, and immediately Kirk says "Well that makes perfect sense!" 2. 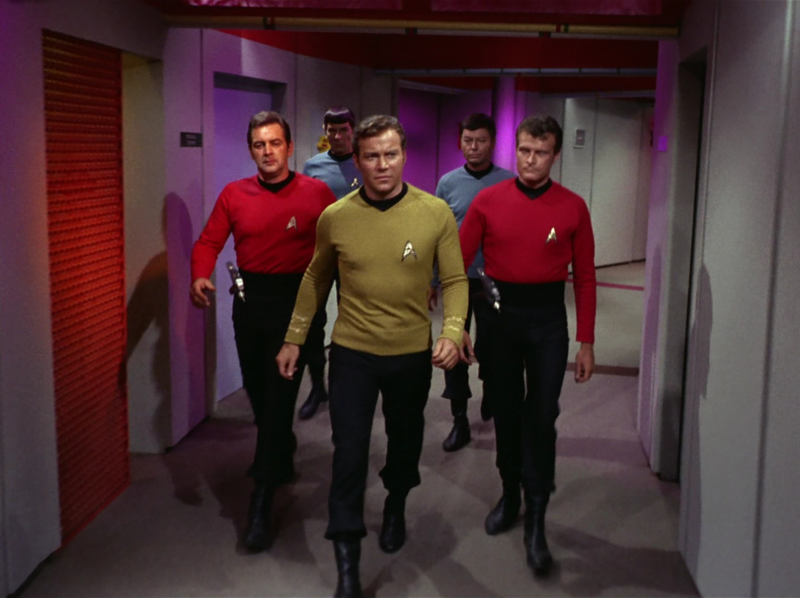 On the bridge right after the Ambassador inhabits Spock's body, Spock starts talking all weirdly and Bones turns to Kirk and says "That's not Spock", Spock then makes a deriding reply to him, in which Bones turns to Kirk again and says "That's Spock!" with a smile on his face. As I'm watching the whole series through, when I get to episodes like this that are original, I'm finding myself enjoying them more and more even if they do have their problems. 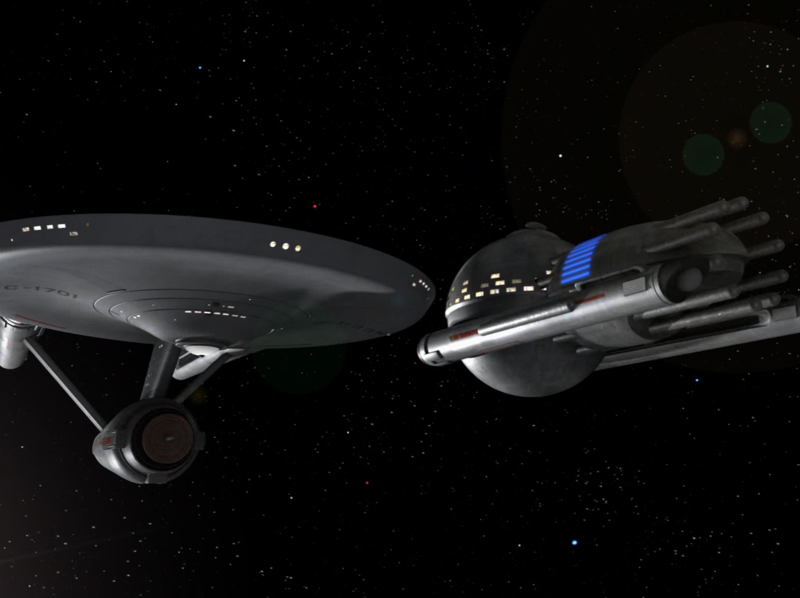 Give me ones like this any day (as well as Spock's Brain) vs the same crappy reused stories and ideas Gene Roddenberry bludgeoned us with back in Seasons 1 and 2.